Legislation sponsored by the chairman of the Senate Banking and Financial Institutions Committee, SB 632–633, will receive a hearing tomorrow in his committee. The bills seek to make several harmful changes to Michigan’s existing data breach notification law. The bills are an overreach by organizations representing the banks and credit unions who helped craft the legislation. It appears that the real problem the bills seek to address is the financial institutions’ displeasure with reimbursement for costs associated with reissuing cards and the type and timeliness of notification. The most troubling of the two bills is SB 633, which if adopted, would double the cost for retailers or business owners who are the victim of a data breach and make an efficient system of notification extremely complicated. It’s already expensive when a merchant is the victim of a breach and has to notify customers and pay fines to the Payment Card Industry for violations of its Data Security Standards. SB 633 would allow a financial institution to also bring a civil suit against a business that has a breach to recover the financial institution’s actual damages (reissuing cards, closing accounts, opening or reopening deposits, refunds or credits made to cardholders, notification). In addition, the bill would require anyone retaining sensitive information to keep it in an encrypted or similarly secure manner, require the merchant provide notice of a breach within three days to impacted financial institutions, and require breached businesses offer identity theft protection and mitigation services for 12 months to affected individuals. 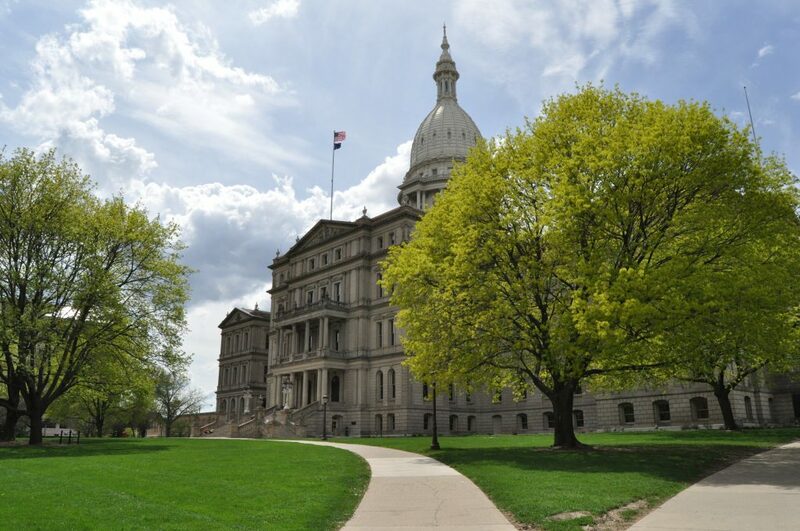 SB 632 would create a Cybersecurity Council to recommend changes to the State of Michigan’s protections and create a voluntary program to identify exemplary cybersecurity practices and recognize entities that have adopted those practices. Under the most recent draft, the council is stacked with government bureaucrats and includes very few business owners. MRA shared our concerns with the bill sponsor, who has refused to make adequate changes to address the logistical challenges his bills would create. Many of the requirements are not logistically possible for merchants to perform. All merchants who accept credit cards are already required to follow the Payment Card Industry – Data Security Compliance (PCI-DSS) mandates regarding different levels of data security and protection, based on the risk of each transaction. These protection levels are audited by the card networks (Visa, MasterCard, etc) and merchants found in violation are subject to fines and penalties. Currently, if a breach occurs, the merchant must notify the card networks, who then notify the financial institutions. The card networks have contractual agreements with the financial institutions to cover the costs of replacing customer’s credit cards and any fraudulent charges. MRA will continue to talk with committee members about the many problems in SB 632-633 and will testify in opposition to the bills along with a large contingent of other business groups who share our strong concerns. Next step: Senate Banking and Financial Institutions Committee hearing on May 1. | MRA Position: Oppose. Michigan Retailers Association held its annual legislative reception on April 24 and had excellent attendance: nearly 130 attendees overall. The event was a combined retailers and grocers’ reception, following the Michigan Grocers Association becoming a division of Michigan Retailers Association in January. MRA continued the grocers’ tradition of showcasing their members by having grocery stores cater the event. Using grocers as our caterers allowed us to further tie in the event with our Buy Nearby program, focusing on locally purchased and prepared food and beverages. The event was a great success and wouldn’t have been possible without our sponsors’ continued support. Thank you to all our sponsors: Amway, Artic Glacier Premium Ice, Busch’s Fresh Food Market, Consumer Healthcare Products Association, Dykema, Kroger, Lipari, Meijer, Oleson’s Food Stores, National Confectioners Association, National Retail Federation, National Association of Chain Drug Stores, Prairie Farms Dairy, Retail Industry Leaders Association, Rite Aid, SpartanNash, Target and Walgreens. For those who were able to attend, we hope you had a great time and look forward to another successful event next year! Alcohol distribution: The House Regulatory Reform Committee reported legislation last week that seeks to clarify and codify current rules on special licensees for events and address issues with product in high demand. HB 5768 would eliminate impediments to the flow of commerce by codifying and amending current rules that govern how beer and wine comes from suppliers to distributers to retailers. Under the bill, an exemption to skip a hold period on the wholesaler’s floor would be created for product in high demand. This would get beer and wine in high demand that frequently sells out quickly back in stock and on the shelves for retailers or for a special event. HB 5767 would allow retailers to provide wine dispensing equipment for special event licensees. Next step: House Regulatory Reform Committee vote. | MRA Position: Support. Michigan Craft Beverage Council membership and duties: The Senate Regulatory Reform Committee heard testimony on legislation last week that seeks to expand membership on the newly renamed Michigan Craft Beverage Council (formerly known as the Grape and Wine Council) and the duties of the council. HB 4667–4668 update references to the council throughout statute and would expand the council to include brewers and distillers. The House added language that prohibits a lobbyist from serving on the council and includes new duties related to marketing and education on craft beer and spirits. The House Regulatory Reform Committee also took up and reported out a similar bill last week, SB 440. Next step: Senate Regulatory Reform Committee vote on HB 4667-4668. House floor for SB 440. | MRA Position: Neutral. Gag clauses: HB 5858, introduced last Tuesday, would prohibit a health insurer or PBM from limiting a pharmacist’s ability to share the lowest priced drug available to a patient. Currently, some contracts may include what is referred to as a “gag clause” that prevents the pharmacy from sharing certain information with patients. Next step: House Health Policy Committee. | MRA Position: Under review. Lockable vials: Legislation introduced last Tuesday as HB 5857 would require pharmacies to dispense certain prescriptions like those for opioids in lockable prescription vials. MRA met with the bill sponsor to share our concerns that these vials fail to stop opioid abuse and actually make the prescription more of a visible target than normal prescription bottles. In addition, there are some problems with the proposed method of reimbursement to pharmacies outlined in the bills. MRA will continue to educate the committee members and others. The bill sponsor himself recognized this bill is unlikely to be approved by the legislature given the strong opposition from groups like MRA. Next step: House Health Policy Committee. | MRA Position: Oppose. Modernizing substitution pricing: Legislation MRA has been seeking to modernize archaic statutory language related to prescription pricing when a substitution occurs received a hearing in the House Health Policy Committee last week. MRA testified in support of the bill. The chairman has scheduled the bill for a vote this Wednesday. Next step: House Health Policy Committee vote. | MRA Position: Support. Drones: This legislation seeks to grant local law enforcement agencies the ability to enter into memoranda of understanding with the Federal Aviation Administration to allow enforcement of federal drone regulations. Some experts have expressed skepticism whether the bill, HB 5118, would have any effect since the state cannot compel the FAA to grant local law enforcement the ability to enforce its regulations. Next step: House Communications and Technology Committee. | MRA Position: Monitoring. Late reports filing penalty: Legislation that would modify the late filing penalty for both LLCs and corporations filing annual reports with the Department of Licensing and Regulatory Affairs was approved by the House last week. HB 4916–4917 lower the fees from a flat $50 fee to $10/month or $50, whichever is less. Next step: House Commerce and Trade Committee. | MRA Position: Support. Monthly payday wages: A bill making a technical fix to keep businesses that pay employees monthly in compliance received a hearing in the Senate Commerce Committee. HB 5235 modifies the statutory requirement for the date of the month by which employers must pay employees who receive a monthly wage. Instead of requiring payment be received on the first day of the month, the bill pushes that back to within 16 days after the end of a monthly pay period. Next step: Senate committee vote. | MRA Position: Support. Nitrous oxide canisters: Last week, the Senate approved HB 5463–5464, bills that would prohibit the sale or delivery of nitrous oxide canisters to minors. The now-enrolled bills attempt to solve the problem of teens using “whip-its” to get high. Misused nitrous oxide can cause brain damage and even death. The canisters are most commonly used to make whipped cream. Next step: Governor’s signature. | MRA Position: Monitoring. Plastic bag ordinances: Legislation introduced as HB 5871 would repeal the 2016 law that prohibits local ordinances or policies regarding plastic bag bans or local fees on bags. Next step: House Commerce and Trade Committee. | MRA Position: Oppose. Pyramid schemes/direct selling entities: Legislation that clarifies what is and what is not considered a pyramid scheme was approved by the House last Tuesday. HB 5726–5729 strengthen state law to stop bad actors and will help clear up public confusion over which direct selling companies are legitimate. Next step: Senate Commerce Committee. | MRA Position: Support. Excise tax on electric bikes: HB 5883, introduced last week would add at $2.00 excise tax on the sale of electric bicycles, mopeds and other electric mobility devices. Next step: House Transportation and Infrastructure Committee. | MRA Position: Monitoring. Income tax reporting: Legislation that would modify the employer reporting deadline for income taxes to comply with federal deadlines was signed into law as Public Act 118 of 2018. The current deadline to report an employee’s income taxes to the Department of Treasury on an annual reconciliation return (MI-W3) in Michigan is Feb. 28. HB 5091 would move that deadline up to Jan. 31, which is the same as the federal deadline for employers. Next step: Senate Finance Committee. | MRA Position: Monitoring. PPT exemption clarification: The Senate recently approved a bill that would modify the current process for filing the commercial Personal Property Tax (PPT) exemption for commercial personal property with a true cash value of less than $80,000. Under current law, taxpayers must file an exemption form with the local unit of government each year. HB 5261 would only require an exemption to be filed the first year and would not require any additional filings unless the property is no longer eligible for the exemption. Next step: Governor’s signature. | MRA Position: Support. Use tax responsibility: The Senate recently approved legislation that seeks to clarify who is responsible for sales or use tax when a property owner supplies material that will be used by contractors. The Michigan Department of Treasury audited and assessed several contractors for Use Tax on owner-supplied materials for projects that affix tangible personal property to real property, making it a structural part of the real estate. The bill will clarify that the tax liability for tangible property purchased by another person and provided to a contractor for installation is the responsibility of the purchaser, not the contractor. Next step: House Tax Policy Committee. | MRA Position: Monitoring. Economic development requirement: Legislation that would prohibit the state economic development grants from being given to businesses that have a large wage gap between the highest paid and lowest paid employee was introduced as HB 5896. The bill would add a new requirement to the state’s strategic fund regarding wage gaps, including bonus compensation, that exceed multiples of 100. Next step: House Commerce and Trade Committee. | MRA Position: Monitoring. Landfill “tipping fee” increase: SB 943 introduced earlier this month would increase the current fee per ton of trash deposited in a landfill from 36 cents per ton to $4.44 for each ton. The bill was introduced after Gov. Snyder called for an increase in landfill “tipping fees” to $4.75 per ton. The legislature has notoriously rejected landfill fee increases and is likely poised to do so again given the bill was sent to the Government Operations Committee, where bills go to die. Next step: Senate Government Operations Committee. | MRA Position: Monitoring.